Mack trucks are seen with pretty good eyes by the truckers, thanks to their capable performances and the solid built quality. 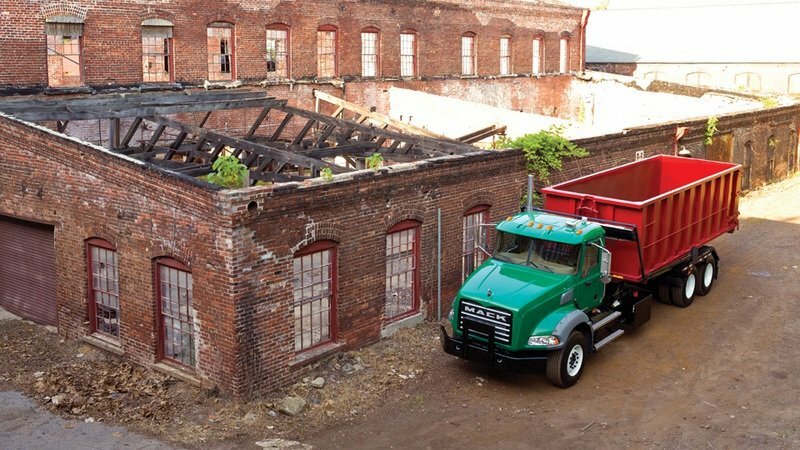 One of the toughest models built by the company is the Granit which was designed for medium duty refuse and construction applications. The truck features a conventional cab design and is available with both axle forward and axle back configurations for enhanced versatility. 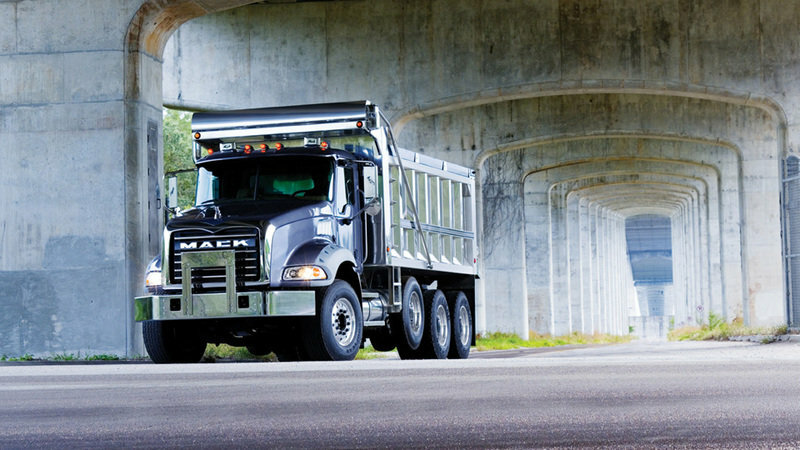 The Mack Granite is available with the MP 7 and MP 8 engine Series which offer maximum outputs between 325-485 hp. Thanks to a solid chassis and a wide area of transmissions and PTOs (power take off) available, the tuck is highly versatile and can be used for a wide range of missions. The Mack Granit is also available with a range of nine frame rail options depending on your needs. 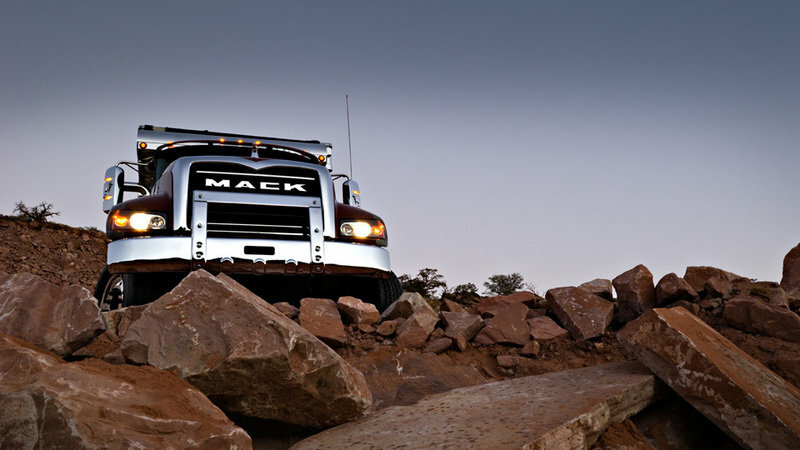 The exterior design of the Mack Granite its perfectly suited to its rugged character. The imposing stance of the truck is underlined by the huge rectangular grille which is decorated by five chromed stripes. The grille also features a chromed border and has the MACK logo embossed at the bottom. The rigged character of the truck is further enhanced by the three-piece bumper which was designed to make replacement easy and affordable. The front headlamps are mounted at the bottom of the oversized wheel arches and their covers are made from durable Lexan which is more resistant than the conventional glass-sealed beam lights. The truck is also fitted with flexible fender extensions which are positioned over the top of the wheels to protect the hood and control splashing. The step brackets, air tanks, exhaust stacks and battery boxes are positioned forward of the rear of the cab for better optional body compatibility. 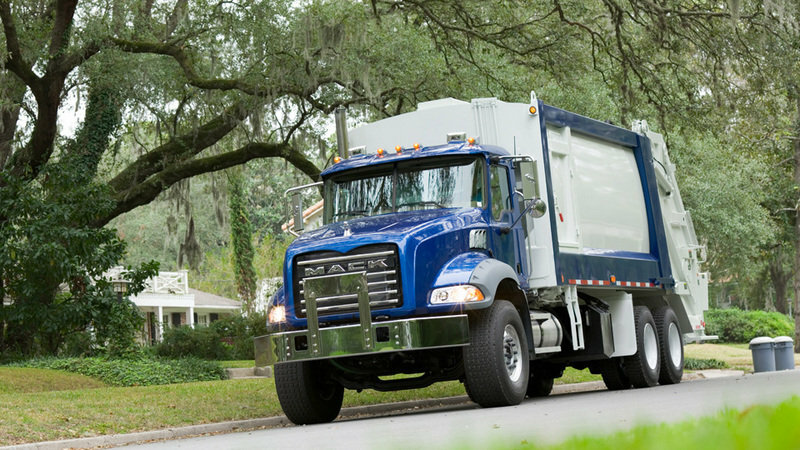 For enhanced versatility, the Mack Granite is also offered with company’s BodyLink wire harness connectors. Getting in and out of the cab is pretty easy thanks to the strategically placed steps and the convenient grab handles. Inside you get a huge cabin with acres of head- and leg-room. Compared to other trucks in the segment the cabin is pretty quiet too, and we also like overall design as is not as rudimentary as we’ve expected. The materials are of course rock-hard, but we don’t have any complains about the overall ergonomy and the controls emplacement. On the other hand, the air hydraulic control switches, electric window and door lock switches are mounted on the door armrest which makes them exposed to weather when the window is down. We also like the interior lightning as it was designed to reduce dangerous glare using four-point lights to illuminates key spots of the cab. The seats are fairly comfortable and come with plenty of adjustments to cradle any body size. For extra comfort the cabin is air-suspended in order to protect drivers from rough roads. 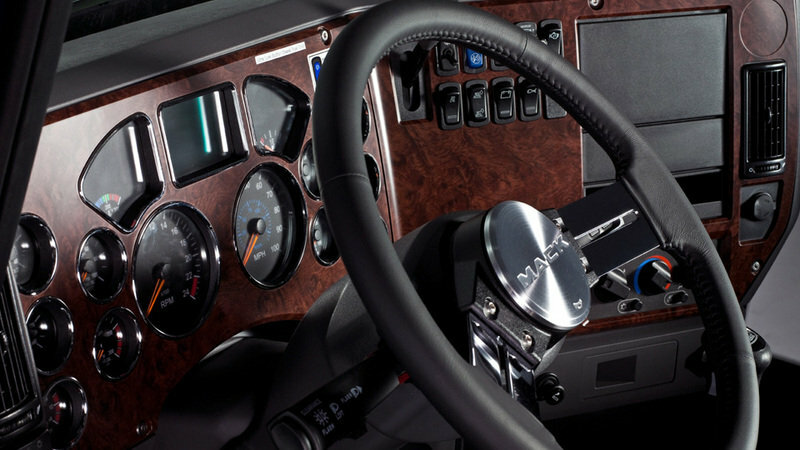 One of our favorite details is the Mack steering wheel which has an ergonomic two spoke design with a few catchy shiny inserts. For more convenience the steering wheel can be also adjusted for both reach and rake. 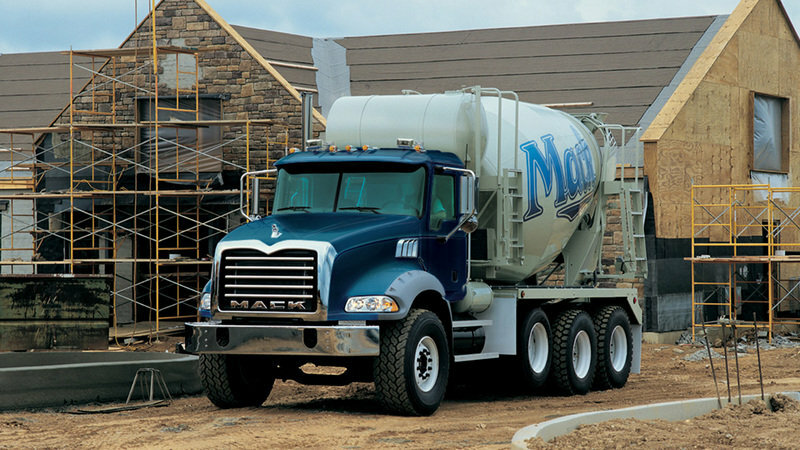 The Mack Granite is equipped with Mack’s Vehicle Management and Control System (V-MAC IV). This system helps you to permanently keep in check the truck and engine, and features over a hundred programmable features. The V-MAC IV also includes ABS-based tamper detection, integrated starter protection, programmable daytime running light overrides and incorporates a trip recorder for vehicle’s trip histories, duty cycle information and scheduled maintenance intervals. The pedals are also pretty ergonomically designed with the accelerator and brake pedals mounted in-line. The clutch pedal is available with air assist and offers a good feel when pushed. We also like the instrument cluster’s layout, as is pretty easy to live with and includes integrated gauge warning lamps, an engine oil temperature gauge, a digital voltmeter and a water-in-fuel indicator. There is also available a big rectangular driver display which hosts an odometer, maintenance indicator, hour meter, Sweet Spot indicator and an ambient temperature gauge. As any respectable truck, the Mack Granite is also fitted with a bunch of useful storage places which include a few cup holders and an overhead console divided into three storage boxes. There is also a large dispatch box in the rear panel and specially designed peg to hang a trash bag. 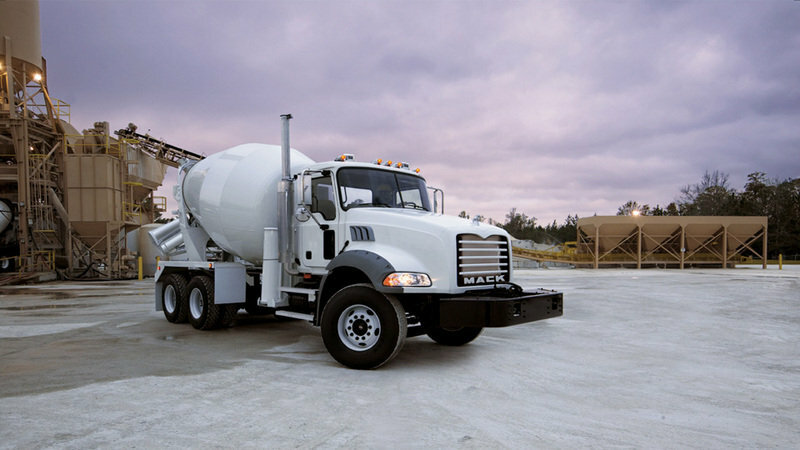 The Mack Granite is available with a choice of MP7 and MP8 engines. The engines offer strong performances and plenty of low end torque. The MP7 develops between 325 and 405 hp, while the MP8 has a horsepower range from 415-505 hp. Both engines meet US’07 emission requirements and since 2010, they are also available with a selective catalytic reduction system (SCR) to offer better efficiency and lower emissions. These engines have a single overhead cam with ultra-high-pressure fuel injection and are offered with electronically controlled Variable Geometry Turbocharger. For enhanced performances and durability they are designed with fewer parts, including one-piece steel pistons, strong bearings and cylinder heads. 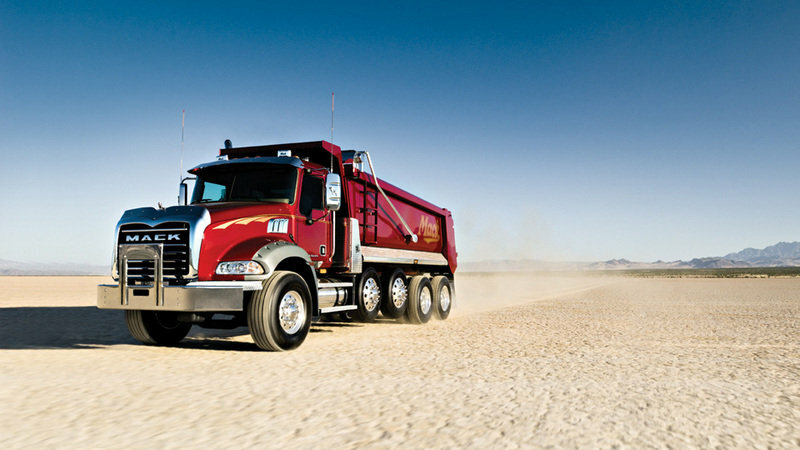 The engines can be mated on Mack’s Maxitorque ES Shift, Allison or Eaton Fuller transmissions which come in various speed configurations depending on the model. The truck’s chassis was developed to handle the harshest conditions and despite its solid nature it was built using lightweight materials. The chassis also features a crossmember configuration for enhanced solidity. 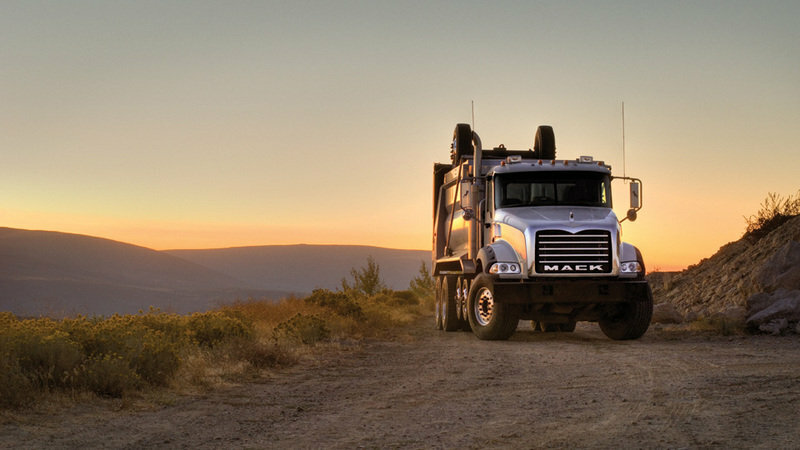 For the difficult off-road terrains, Mack offers the convenient, one-touch Central Tire Inflation system which gives you quick control of tire pressure. The truck is equipped with large, outboard-mounted air springs which were designed to provide cushioning, stability and reduced vibration. This sounds good on paper, but in reality the off road ride is harsh and every road bump is directly transferred into your spine, despite the air suspended cab. The steering is pretty good on the neat roads, but when you’ll go on harsh terrains it becomes unsettled and everything gets even worse due to the harsh front end suspension. 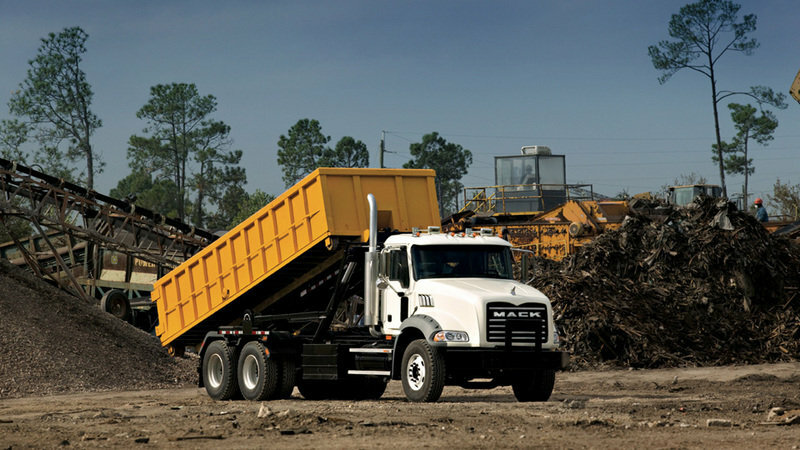 The Mack Granite is strongly built, has a tough chassis and features an ergonomically organized cabin. The engines are also pretty lively and can deal effortless with almost everything you’ll throw at them. We also like its high tech systems which help the driver to get the job done fast and safe. On the other hand, the ride is very harsh on the uneven terrain and the steering could’ve been better.